Hi all, sorry I have been missing for the last few days – we have no internet at the moment and apparently it won’t be back until at least tomorrow, but thanks to the wizardry of Nathan I have been able to post this one and hopefully regular service will resume shortly! I didn’t realise how much I relied on the net until now.On to todays card. The paper is Prima Lyric – not made specially for christmas, but I thought the colours worked! A little bit of fussy cutting, bright red ribbon bow and a Stamp It Joyful Christmas stamp and there my first christmas card for the year. Tomorrow, if I am back on line we will move on to something else! Til tomorrow…. hopefully ….. Although this Prima Lyric paper isn’t Christmas paper, I did make a few xmas cards from it – the colours and the word Joy just jumped out at me – so I will show them and then we will move on to something else in the next couple of days. 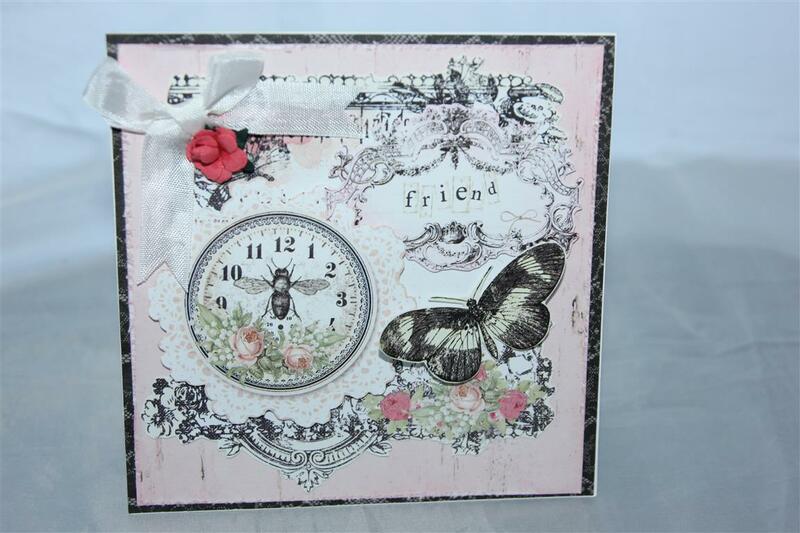 Just a bit of fussy cutting on this one – no ribbon or flowers for this card .This beautiful paper doesn’t need any embellishing.Tonight I am off to the craft room to organise my August classes – I have been very lazy this week and haven’t done any crafting in the craft room, but that is set to change! Til tomorrow…. Again, Prima Lyric paper(A4 pad) with a bit of fussy cutting, seam binding and a flower. 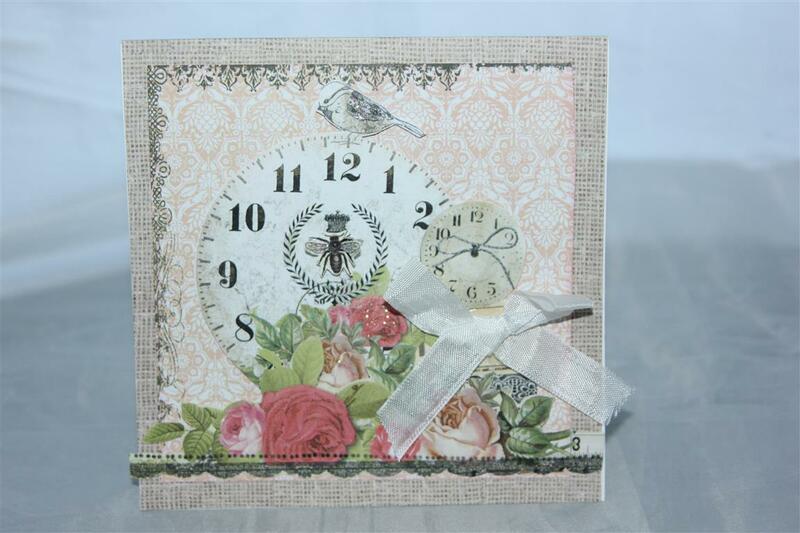 There are a couple of layers of fussy cut flowers on this one which doesnt show up in the photo.Another caold week here, but I have been busy while sitting in front of the heater in the evenings – i have been fussy cutting with some new papers which I hope to turn into cards this weekend, and I have also stamped and coloured some images as well, so lots of projects ready to go when the craft room warms up a bit! Til tomorrow…. 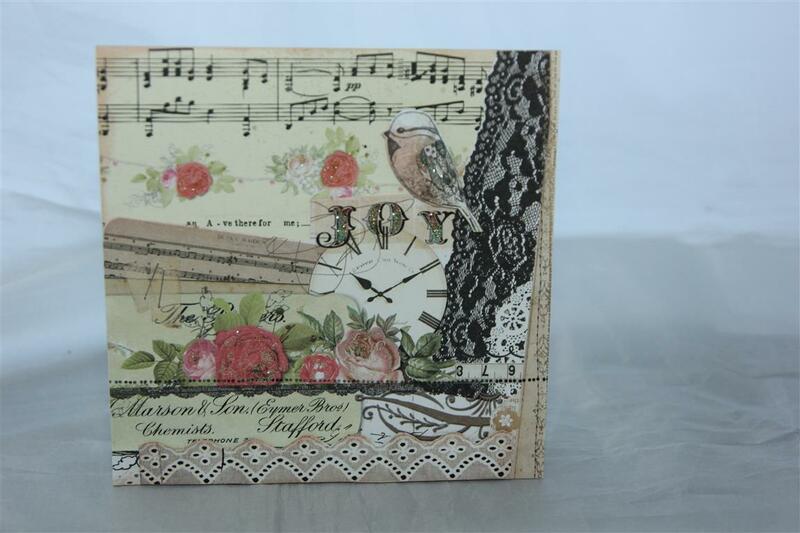 More fussy cutting and layering on this card ade with prima Lyric (a4 paper pad) Just had to add a seam binding bow on this one.My working week began today, always a shock to the system, so no crafting on the agenda tonight – just a lazy one in front of the t.v. and heater! til tomorrow…. 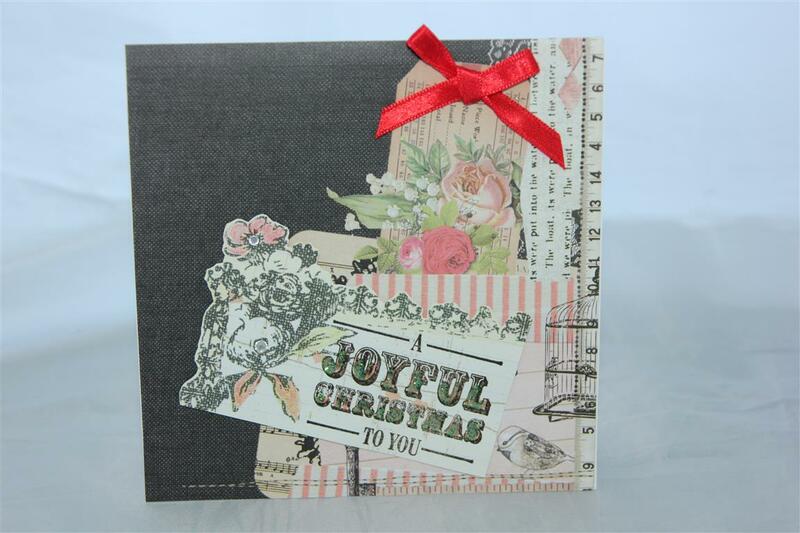 There were lots of great images on this paper ( prima Lyric) to fussy cut, and I have used a few of them on this card.I layered a couple of pieces of the patterned paper, and added a flower and seam binding bow to finish.I bought some new christmas paper today, so I will be in the craft room if anyone needs me! Til tomorrow…. I took some time to think about todays post as it’s amazing to me that I have been posting on here long enough to reach 1000 posts, so I wanted a card that reflected my crafting style and conveyed what card making means to me. 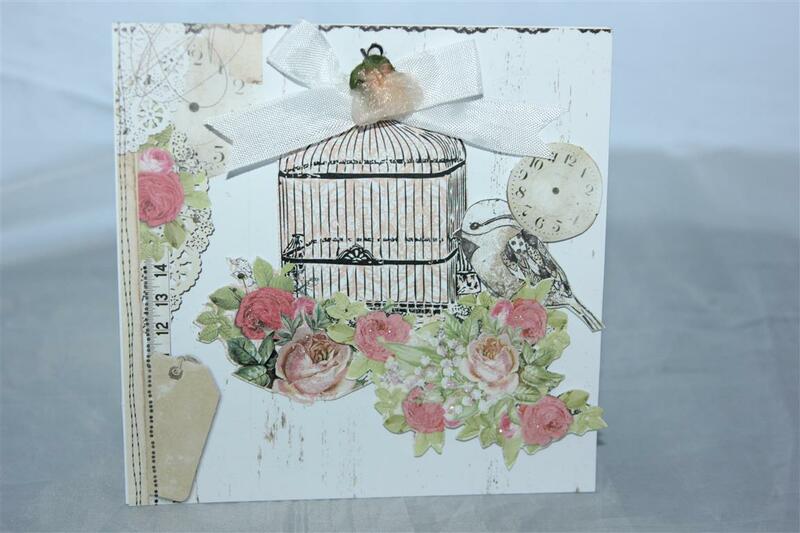 I settled on this card which I made using Prima Lyric patterned paper ( a4 pad) because I have done a lot of fussy cutting here which is my favourite way of making cards. I took that pad apart and fussy cut just about everything as you will see over the next few days. 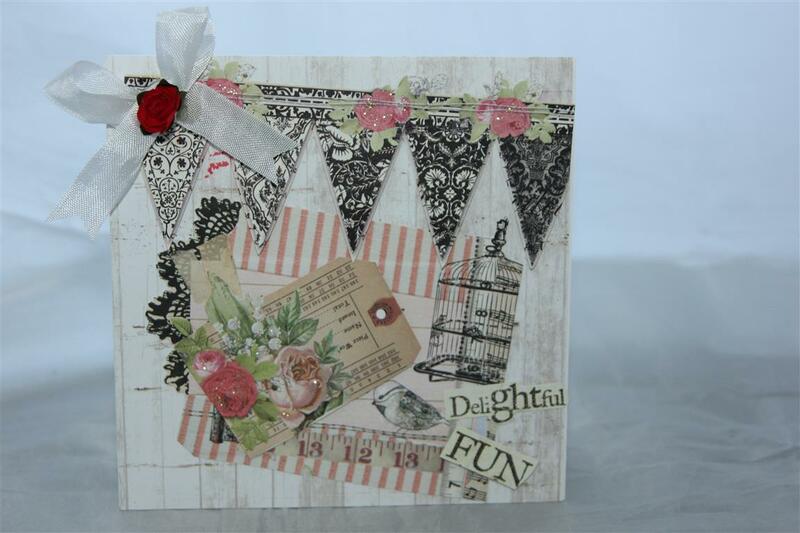 I just added a seam binding bow ( ribbon also features on most of my cards) and a flower and kindyglitz. The words down in the right hand corner explain what crafting means to me! Til tomorrow….